Close to Kalamaki's gently shelving sandy beach, the attractive and modern Hotel venus guarantees you the true meaning of Greek hospitality. It has a welcoming atmosphere, and you can unwind by the pool or in the attractive cocktail bar. We have been to Kalamaki before and booked direct with the Venus hotel. It was very easy to book via e-mail and the hotel arranged transport from the airport. The hotel is in a spot just a couple of minutes’ walk from the main bar/shopping area and ten minute stroll to the beach. The hotel is kept very clean and the rooms are big enough. As we booked direct, safe and air conditioning were included in the price. The buffet style breakfast was good and staff were happy to cook you an omelette or fried eggs when you asked. The bar snacks were very good and reasonably priced. If I have one negative, it is that the air conditioning was not always on in the bar in the evenings which made it very uncomfortable as the temp didn't drop much below 30 even at night. Overall I would recommend this hotel but be aware that there is nothing for children other than the pool. Well, what can I say? The Venus certainly lived up to its reputation. I did my research before going and the hotel was being praised to the hilt. After a friendly welcome and swift check-in we were pointed in the direction of our room. We were on the second floor and as there was no lift my hubby lugged 2 large suitcases up the marble staircase. This was the one and only negative (if you can call it that) of the Venus. I'd requested a double bed by e-mail and that's what we got, along with a dressing table, 2 bedside cabinets, a huge wardrobe with plenty of drawers and a TV. A hairdryer and tea making facilities were also supplied. We had a smallish balcony with table and 2 chairs and we looked inwards towards the garden. The bathroom was well decorated with a bath and over-bath shower. We had to pay extra for the air conditioning, safe and fridge as we booked through an agent rather than direct with the hotel (we already knew this before hand). Daily maid service was excellent. Clean towels every day and bed sheets every 3 days. The pool was of average size with plenty of sun loungers available in the sun and under a nice shady area. You had to pay 6 Euro a week for the mattresses. We regularly purchased lunch from the pool snack bar and the menu was really varied and the food delicious. The bar was well stocked and the drinks prices were the same as a lot of the bars in the resort. The reception/bar area was large and airy and the hotel put on a variety of entertainment during the fortnight eg live singer, quizzes and bingo. The Venus's location was spot on- just down a side street which led to the beach but not far from the main road which was lined with bars and restaurants. 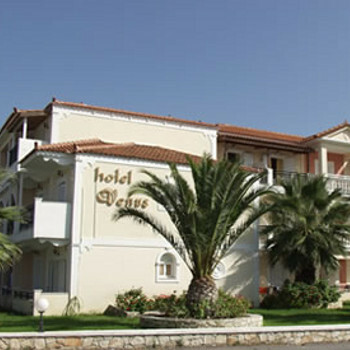 If we were to visit Zante again, I would definitely stay in this hotel again. I can highly recommend it, along with the loads of return visitors that frequent the place. The Venus is located in an excellent position, down a side road off the main Kalamaki strip. The staff are very helpful & pleasant, and the comfort of visitors is important. All public areas are kept spotlessly clean, and everything is well maintained. The rooms are a reasonable size, and there is plenty of cupboard and drawer space. Sheets and towels are changed regularly and there is a daily maid service. If booked through the tour operator then you have to pay extra for air con, safe and fridge, but if booked independently these are included in the price. The pool area is immaculate with plenty of shade if needed. There is a charge of 7.50 Euro a week for mattresses for the sunbeds which are plentiful. For Greece the breakfast is excellent, with bacon, sausages, eggs, pancakes, continental meat, cheese and olives. Food at the snack bar is varied, and is served quickly. The bar is well stocked, and for a hotel, prices are competitive. There is occasional evening entertainment, quizzes, bingo and BBQ night. We found the Venus to be excellent value for money. This is our 6th visit to the Venus and it didn't disappoint. Booking direct with Nick is simple and straight forward. There is a huge choice at breakfast and the staff are always so cheerful. The food at the snack bar is reasonably priced and delicious. The bar is where most people start and finish off the evening so friendships are made here and the atmosphere is great, as well and the fabulous cocktails. Donna and Spiro should be on stage with their double act!! The Venus hotel had LOTS of "fantastic" reviews, and yes it is a lovely hotel and it is clean and the staff are pleasant but its no different to any other 3star hotels i have stayed at before. First time at this hotel, second time in resort. Booked direct, easier than we thought, gained 10% discount had aircon, fridge, safe free. We thoughly enjoyed ourselves, hotel more central that previous stay at Bitzaro Palace. We will certainly go direct again. All staff we helpful, sheerful, even in that heat. Excellent hotel with first class staff and management . This is our second visit and would always go back. Very clean and brilliant service. a magical place in paradise!!! Nike and the rest of the team are there for you and try to solve any problems you may have. We only had to ask about changing our room due to the postion it was in and we were given another room else where in the hotel. Breakfast is very basic but you can buy a full english breakfast for 4 euro and still have the other as well. We would come back to this hotel when we can get some cheap flights. This is our second time to the Venus and can't recommed this hotel enough. We have now become Club members which entitles us to 10% off purchases and booking. We had a triple room which was big enough for us as our daughter is only 8. Cleaner was in daily doing a great job. She always arranged: nightware, pillows and my daughters dolls differently each day much to her delight. There were more towels than you could shake a stick at. Hotel staff were great. Poor Maria at the pool snack bar keep us fed and watered - not an easy feat as there was 7 of us altogher. Nick & the reception team were brilliant as were Donna and Danny on the bar.